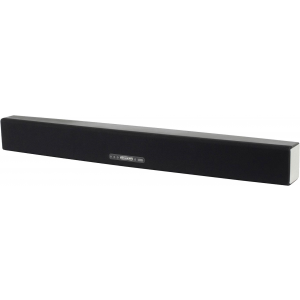 Monitor Audio ASB-10 compact Active Soundbar, with wide-ranging wireless functionality, easily and discreetly transforms your AV experience. We also sell the Wireless WT-1/WR-1 kit. Earn 399 loyalty points when you order this item. Monitor Audio ASB-10 compact Active Soundbar system, with option of adding an active subwoofer, and wide-ranging wireless functionality, is expertly engineered to re-energise HD and UHD pictures with the rich, detailed, immersive sound you’ve been missing. Equipped with a precision-tuned high performance 2.0 audio design comprising proprietary driver/amp pairings, integrated Dolby Digital processing and superior Bluetooth apt-X wire-free streaming, the super-slender ASB-10 will generate big audio dynamics from TV, games, discs and smartphones, to become the audio hub for every home. With a compact 90 x 94mm cross section and at just under a metre in length, the discreetly proportioned ASB-10 complements the look of flat screens from wall or table-top positions. Its slim moulded polymer cabinet with black cloth grille and stylish brushed aluminium end trims houses an array of four Monitor Audio 3" C-CAM bass drivers (assisted by a brace of passive bass radiators), and twin 25mm C-CAM Gold Dome tweeter. The ASB-10’s proprietary drive-unit configuration is powered by as many as four integral DSP-trimmed amplifiers, individually calibrated by Monitor Audio engineers for optimum audio control and response. From so svelte a system the result is a size-defying success, injecting your music and film sound with greater scale, detail and rhythmic mid-bass definition. Installation couldn’t be any simpler. A single, easy, optical or coaxial SP-DIF link to the TV allows the ASB-10 to decode digital audio from connected sources. Activated automatically when a signal is received, the ABS-10’s on-board Dolby Digital and Dolby Pro-Logic II decoding ensures wide compatibility with film and games content. Dolby’s Virtual Speaker processing, which is designed to replicate a three-dimensional surround sound experience, is enabled via a button located on the front panel or remote handset. In addition the ASB-10 will energise streams of uncompressed CD-quality audio from your smartphones and tablets through its effortless Bluetooth apt-X wireless technology, and also accept legacy analogue sources via a 3.5mm stereo input. In most circumstances the ASB-10 will deliver ample levels of bass, but for low frequency enthusiasts Monitor Audio has developed the optional WS-10 active sub-woofer, purpose-built to add big bass dynamics to the ASB-10 system and all space-efficient set-ups. 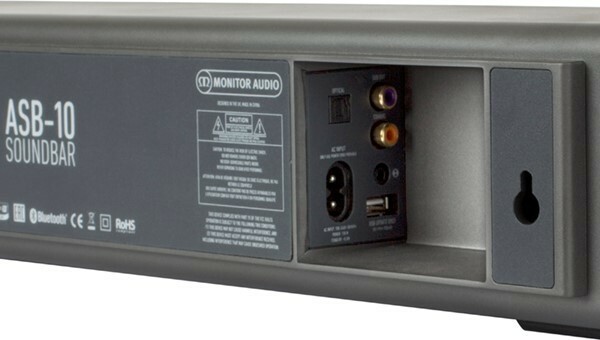 Complete with three-position EQ and a high quality digital wireless link to the ASB-10, the WS-10 is a compact and versatile design, comprising an 8" C-CAM driver powered by a 120 watt amplifier, generously provisioned with individual volume and phase controls, and a standard array of wired LFE and 12V inputs for integration with an AVR in alternative system applications. For ever greater system design versatility, the WS-10 can connect wire-free to other systems via Monitor Audio’s WT-1 transmitter module. Equipped with twin HiVe reflex ports, the WS-10’s robust, low-profile cabinet of 18mm MDF is designed with flexibility in mind, wirelessly extending the ASB-10’s full-range delivery and contributing deeper bass to any Sound-Bar or compact satellite system through wired or wireless connections from the widest range of discreet room locations: beneath furniture, along room boundaries or in corners. Decades of dealing with long, ugly cable runs can be consigned to history in minutes by installing the diminutive WT-1/WR-1 wireless link (available separately). Measuring just 6cm round by 4cm deep, the WT-1 transmitter and WR-1 receiver establish an automatic lossless audio connection between analogue outputs and inputs over a range of up to 15 metres. The pairing is entirely intuitive and immediate: no elaborate button pushing is necessary. Tucked out of the way behind equipment, the WT-1 transmitter (available separately) simply plugs into the analogue LFE or pre-outputs on your AVR or player, and the WR-1 receiver (available separately) into the inputs of a remote subwoofer or amp. The unobtrusive, ultra-compact modules then use the 2.4 GHz digital band to send uncompressed full-range audio through the air between them.